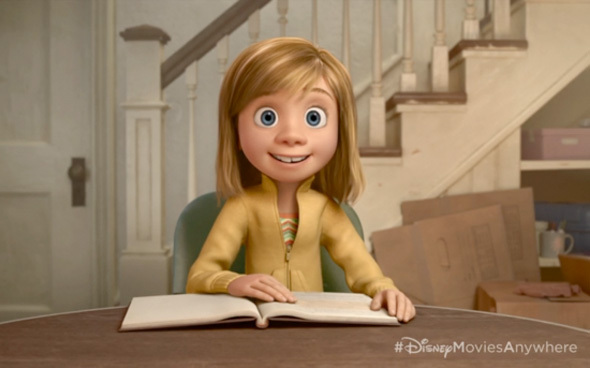 So far, we've only seen a brief glimpse of Pixar Animation's forthcoming movie Inside Out. The film follows a little girl named Riley, who is uprooted from her Midwest life when her father starts a new job all the way in San Francisco. Like all of us, Riley is guided by her emotions – Joy (Amy Poehler), Fear (Bill Hader), Anger (Lewis Black), Disgust (Mindy Kaling) and Sadness (Phyllis Smith). 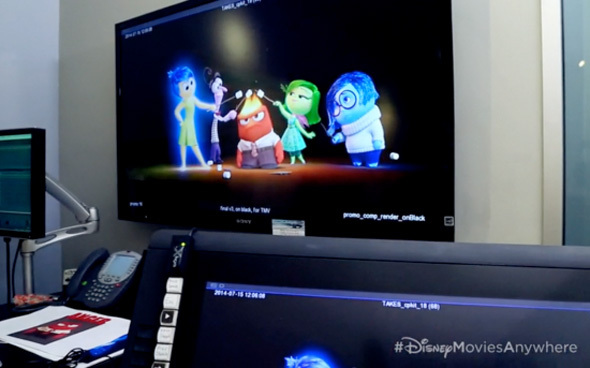 The emotions are the only first look we've gotten at the 2015 release from Pixar, and they're a big part of the movie as they live in Headquarters, the control center inside Riley’s mind, where they help advise her through everyday life. Now we finally have the first image of Riley in the film as well, though we're still not sure who is voicing her. As you can see in the second image above, the rest of the emotions are roasting marshmallows on Anger's head, which is part of a "completely cartoon" style that Pixar hasn't really attempted before. Director Pete Docter says they wanted to go for something a little more abstract. And with a focus on these emotions inside Riley's mind, that's finally possible. Docter adds, "We learned by obsessively watching Hollywood cartoons growing up, over and over again,” while producer Jonas Rivera added, “We really wanted to push, and caricature, and squash, and stretch, and go back to some of those principles that got us loving animation.” That certainly sounds like this year-long absence of a feature film from Pixar will be worth the wait when Inside Out finally arrives in theaters on June 19th, 2015. This looks great, and I sure Pixar will knock it out of the park, but....wasn't there a terrible short-lived 90's sitcom with a similar premise? Pixar has been in a rut recently...hopefully this get them back on track. I can't help but relate that face to Elly from UP. The concept for this is lovely and will definitely return to form for Pixar Animation. So where does Riley fit into the Pixar theory universe?